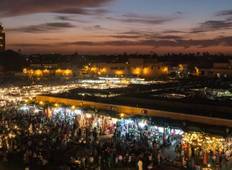 Discover cultural tours in Morocco in March 2020, visiting places like Marrakesh and Fes. Book now and save with TourRadar.com! "The tour was fantastic. We had an amazing guide that was very knowledgable and always..."
"HIcham is up there with the best - he is knowledgeable, friendly, patient and very..."
"The tour gave us a great overview of different parts of Morocco, from villages to..."
"We saw many great sites in a short period of time. Was a very tiring trip but that..."
"Our South Morocco tour was everything I hoped for. I learned and saw many new things,..."
"Great value for money, Morocco is an incredible place, we got to see so much on this..."
"I loved so much about this tour...the guide(s), the driver, the itinerary and the..."
"I had really good time with intrepid tour group. My guide was a nice person and it..."
"Driss Maaza, Tour Leader Moroccan Tour is one of the best tour guide. Patient, courteous,..."
"I think I would have a better time in Morocco in a warmer season. January was too..."
"I can't speak highly enough of my Intrepid Morocco Uncovered Tour and our guide Fouad..."
"Overall its a good package. The most important thing that Morocco should look into..."
"It was an amazing experience!!" "Great tour, great guide, well planned"
"It was a great experience! I shared 9 days with cute people! We had the chance to..."
"This tour was way better than I expected. Every day was a new exciting experience...."
"Come with me to the kasbah! The sights and sounds are unforgettable- very memorable..."
"Thanks to Timeless tours for such an amazing experience. lots to see and do. Mustapha..."